1. Executive Trainee No. Of Post: Total No. 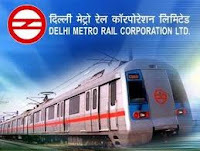 Vacancy Recruit 25 (Civil-10, Electrical-08, Signal or Telecom- 06, Architect- 01) In DMRC. Salary: The trainees will be paid a stipend of Rs. 25000/- per month. Qualification: The Candidates Should be Pass one year ‘Post Graduate Diploma Course’ in “Metro Technology and Management” at IIT/Delhi. Age: The Candidates Minimum age 28 years as on 01st January 2012 (i.e born earlier to 02.01.1984), with 3 years relaxation for OBC and 5 years relaxation for SC & ST.
How To Apply:- The Applicants will now send duly filled applications & one copy of “Registration Slip” so as to reach the DMRC Limited, Post Bag No. 9, Lodhi Road Post Office, New Delhi – 110003 latest by 04.04.2012.